From February through June, we will be highlighting the ways that UW-Madison changes lives for the better throughout the state of Wisconsin. March's theme is Working for Rural Wisconsin. Watch for more at #UWChangesLives on social media. And here's how you can help. A new hands-on training program in organic agriculture provides a pathway into agriculture careers for the nearly 75 percent of aspiring farmers under age 40 who didn't grow up on a farm. 'Apprenticeship is an excellent fit for vegetable farming because so much of how we learn to grow food - is by growing food,' said Claire Strader, UW-Extension Dane County organic and small scale produce educator. The Organic Vegetable Farm Manager Registered Apprenticeship program was developed through a collaborative effort involving the Department of Workforce Development, FairShare CSA Coalition farmers, UW-Madison and the UW-Madison Division of Extension. It was inspired by the success of the Dairy Grazing Apprenticeship - the first registered agricultural apprenticeship in the country. Farmers struggle to find reliable, skilled farm workers to meet the fast-growing demands of the organic food market. The program is the first of its kind in the nation, combining formal, on-farm experience with coursework delivered through the Wisconsin Technical College System. 'The classroom is the place where apprentices will be able to dig into concepts that are harder to learn in the field, concepts that will support and expand their on-the-job training,' said Strader. The two-growing season training follows a competency-based curriculum, crafted with input from farmers and agricultural educators from across the state. Dawson and WTCS instructor Valerie Dantoin worked closely with two farmers to develop the course curriculum, which makes up about 10 percent of the program. Apprentices spend the remaining 90 percent in the field learning how to do every task an organic vegetable farm manager will need to do. Participants who complete the program are then ready to step into managerial roles, often on the farms where they apprenticed, or potentially start a farm of their own. The program was reviewed and approved by the Bureau of Apprenticeship Standards on June 1, 2018. 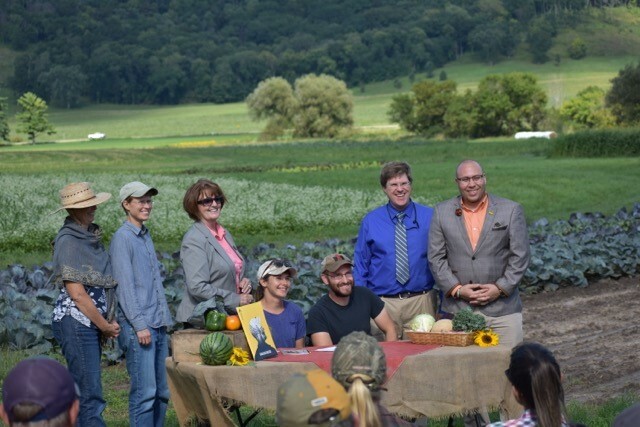 Dawson believes the formal recognition of the training as the first state-accredited apprenticeship for organic vegetable farming in the United States is extremely valuable. To find out how you can be involved as a farmer-educator or an apprentice, visit here.